The rapid calcium influx of phase 2 of the cardiac myocyte action potential incites CICR from intracellularly sequestered, sarcoplasmic reticular calcium stores via (predominantly) ryanodine receptor (RyR)-mediated release. RyRs are the largest ion channels characterized to date: homotetramers consisting of four monomers that are each ~560 kDa and have large cytoplasmic domains (Wehrens and Marks, 2005; Santonastasi and Wehrens, 2007). These cytoplasmic domains also serve as the junctions at which diffusible regulatory proteins, such as FKBP12.6 (otherwise known as "calstabin2"), can potently modulate channel function. 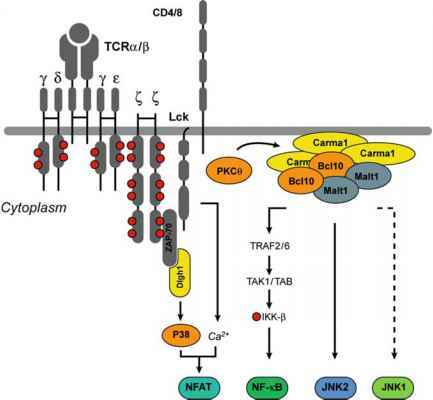 Calstabin2 binding to RyR2 can be physiologically regulated by PKA phosphorylation. In response to sympathetic stimulation, activation of the cAMP-PKA pathway leads to dissociation of FKBP12.6 from the complex, which provides a mechanism for modulating Ca2+ release from the SR. In failing hearts, PKA hyperphosphorylation of RyR leads to FKBP12.6 dissociation and abnormal channel function (Marx et al. 2000). Administration of metoprolol reverses the hyperphosphorylation, restoring the normal stoichiometry of the RyR macromolecular complex and normal channel function (Reiken et al. 2001). RyR2 phosphorylation is potently modulated by macromolecular complexes (Fig. 2). These macromolecular complexes are formed by scaffolding proteins anchored at cytoplasmic domain LIZ. Through LIZ binding with the anchoring proteins spinophilin, PR130, and mAKAP, the phosphorylation state of RyR can be tuned by PP1, PP2A, and PKA/phosphodiesterase PDE4D3, respectively (Marx et al. 2001b; Lehnart et al. 2005). In disease states such as heart failure, the amount of PP1, PP2A, and PDE4D3 associated with mAKAP is reduced, potentially accounting for the PKA hyperphosphorylation of RyR2 (Marx et al. 2000, 2001; Lehnart et al. 2005). The rebinding of calstabin2 to RyR2 is an important target for heart failure and arrhythmias. Administration of K201, also termed JTV519 (a derivative of the 1,4-benzothiazepine), can promote this rebinding and has been shown to reduce heart failure and arrhythmias in several animal models (Wehrens et al. 2004, 2006; Yano et al. 2003).